Watching “Attack on Gorilla City,” I couldn’t get Planet of the Apes out of my mind. No, not the 1968 film itself. But famed Twilight Zone creator Rod Serling’s actual screenplay, written before later changes were made during production. In it, Serling chooses not to have the apes living in so-called primitive communities as the film presents. Instead, he displays intelligent apes in a world similar to our own. The script dwells on the unease of witnessing apes living as we do — walking down paved streets, working as police officers, shopping in stores. In the comics and the great Justice League: Unlimited animated series, Gorilla City is an extremely advanced society that far surpasses that of the rest of humanity, to the point that they’ve cloaked their location from the rest of the world. None of that inventiveness is in this episode of The Flash. Instead, the show presents exactly what you’d expect: A gorilla society that is allegedly advanced, but is never shown as such. The color palette is composed of only musty browns and deep greens. There is neither visual wonder nor narrative cunning here. It’s a cute but lackluster episode. Ultimately, “Attack on Gorilla City” demonstrates a failure of imagination. It’s a shame since the episode has all the ingredients for something far better than what it turns out to be. Barry, Cisco, Caitlin, and Julian (in his best Indiana Jones cosplay) travel to Earth-2 to save Harry. Meanwhile, an overeager Wally and hopeless Jesse take over the hero duties for Central City. “Attack on Gorilla City” really has it all: faked deaths, mind-controlling gorillas, and Barry fighting Gorilla City’s leader Solovar (voiced by the booming Keith David) in a gladiator arena. How did this show make the Flash fighting a telepathic gorilla voiced by the actor who had great turns in classics like The Thing and They Live so boring? After traveling to Earth-2, the team quickly finds themselves in the middle of a trap. This leads them to worry: Is Harry still alive, or has he been beaten to death like his companions, who joined him entering Gorilla City? When his team wakes in a prison, their dilemma only gets worse. Neither Cisco’s nor Barry’s powers seem to be working, which suggests Grodd is dampening them somehow. Speaking of Grodd, he mind-controls Harry in order to deliver a message. At least Harry is alive. Apparently, Grodd devised this entire trap to get Barry’s help. Solovar distrusts and hates humanity. He also wants to take the fight to Central City before humans have the ability to hurt Gorilla City. Grodd wants Barry to kill Solovar so he can become Gorilla City’s ruler. It isn’t only control he wants, though; he hopes to protect the city he still considers home. “Kill or be killed,” Grodd says about the gorillas’ philosophy. This explanation is so hackneyed, it’s ridiculous that Barry doesn’t see through it from the jump. Barry agrees to face off with Solovar to save his friends and potentially Central City from turning to ash. “Speedster versus super gorilla. Best worst video game ever,” Cisco says. Episode director Dermott Downs and The Flash’s special-effects team do have fun constructing the fight. They’re aiming for something epic, full of lens flares and slow motion. The camera zooms in on blood from a badly beaten Barry before Solovar launches into yet another attack. Barry is losing. Badly. Until Cisco suggests he pull a Reverse Flash on Solovar. One vibrating hand punch later and Solovar is down. But Barry refuses to cross that moral line of killing him. “We call it mercy,” Barry bellows to the audience of gorillas filling the seats of the arena. The problem with the fight is that, like many aspects of this episode, it lacks imagination. I don’t understand why Cisco needs to talk Barry through every move he makes. At this point, he knows how to fight. Those moves are commonplace for him. Why couldn’t he decide what to do on his own? After getting shot with a knockout dart, Barry wakes up in his cage again. Winning has done him no favors: In a surprise to absolutely no one, Grodd was lying. He only wanted to usurp power from Solovar so he could take control of Gorilla City and lead its army to raze Earth-1’s Central City. He’s still pissed about being sent there and being a lackey to another gorilla. But for Grodd to go to Earth-1, he needs Cisco to open a breach. This leads the team to devise a lot of dour plans. Cisco thinks Caitlin should kill him. Grodd doesn’t know she has powers, so it stands to reason he wouldn’t try to dampen something he knows nothing about. If she kills him, Grodd can’t get back to Earth-1. Caitlin refuses, of course. They go back and forth for a while until all the death talk gives Barry a spark of inspiration. When Grodd returns to the makeshift prison, he finds Barry sprawled on the floor. Caitlin is crying, suggesting the fight must have ruptured an organ. Grodd feels for a pulse and drags a cold Barry out of his cage. That’s right: A superpowered, genius, telepathic gorilla is outsmarted by Barry playing dead. It’s a leap in narrative logic that turns “Attack on Gorilla City” from a disappointing to outright insulting. If making characters suddenly act stupidly is your only way to push the plot forward, you have a problem. Meanwhile, Wally and Jesse are keeping themselves busys as Central City’s main heroes. With most of the team gone, will they face a powerful metahuman? A time traveler? A figure from Barry’s past? Nope. They save the city from two standard-issue bank robbers. This scene is a bit clever, though, and Wally is quick with one-liners. As he apprehends the robbers with ease, Jesse looks on both bemused and a bit annoyed. We don’t see Wally take the robbers down; instead, we watch Jesse’s reaction as yellow sparks reflect across her face. Unfortunately, that look on Jesse’s face underscores the problem that most annoyed me about this episode. It isn’t the underwhelming return of Grodd or even the obvious fact that Julian and Caitlin are headed for romantic territory. (Poor Julian, I was just starting to appreciate his sassiness and cynicism. 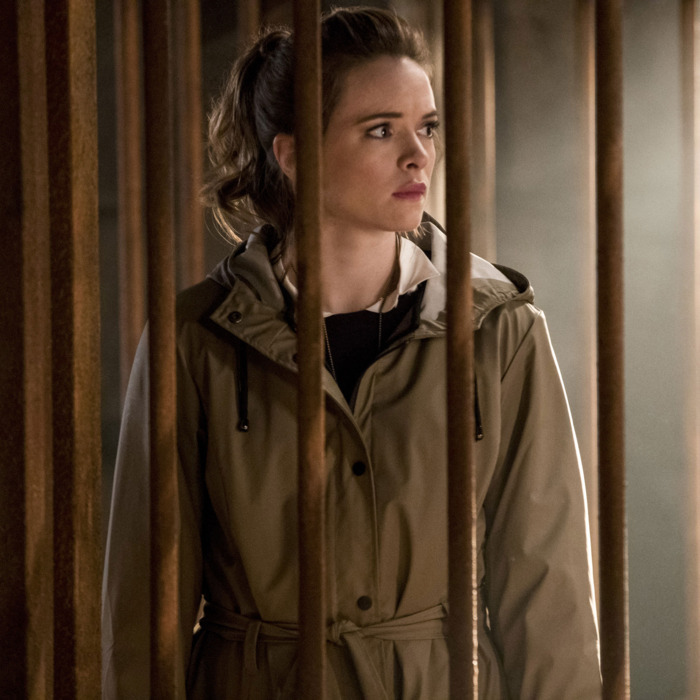 We all know a romance with Caitlin is a death sentence.) What truly bothered me were the dynamics between Wally and Jesse. Pretty quickly, Wally notices that Jesse’s sour mood isn’t just because her dad was kidnapped by telepathic gorillas. No, she’s feeling a bit sidelined. Since Wally has gained powers, he hasn’t been in contact with Jesse as much as he used to. Considering they live on different versions of Earths, I don’t understand why they’re going for a relationship in the first place. “Being Kid Flash, you were complete,” Jesse says. Is that a bad thing? Jesse feels threatened by Wally living up to his potential, as if being incomplete is the only way for a relationship to be necessary. “I’m not complete with you,” Wally responds. It gets worse. Wally decides to ask Jesse to move to Earth-1 so they can really be together. After being unsure and getting advice from HR, she agrees. Where do I even begin? No man is worth leaving your entire universe for. Doesn’t Jesse have friends, other family members, and a life of her own on Earth-2? Considering the complications of the move and what she leaves behind, this makes no sense. They’re still very young. This isn’t love; it’s a crush. Have they even gone on a date yet? The Flash’s conception of love has the depth of a thimble. (Although Barry and Iris continue to be adorable.) Also, Wally deserves better story lines than this. He’s an iconic character and Keiynan Lonsdale is so charming he almost distracts me from the character’s uninteresting story lines. The ending of the episode doesn’t give me much hope, either. The final scene shows Grodd speaking to a captured Gypsy, overlooking hordes of armored gorillas readying for battle. It’s meant to be thrilling, but it simply raises more questions about this flimsy narrative. If Grodd could get ahold of Gypsy, why bother troubling with kidnapping Harry to get to Barry and Cisco? Even when The Flash feels a bit poorly constructed, it’s usually able to charm its way into being watchable. “Attack on Gorilla City” suggests that The Flash can’t skate by on charm alone anymore.